Reigning MotoGP World Champion Valentino Rossi joined Yamaha at the start of the 2004 season, and quickly stunned the world by winning the season-opening Grand Prix in South Africa, becoming the first rider in the history of the sport to win back-to-back premier class races for different manufacturers. He went on to win nine out of 16 races, finally clinching the World Championship title - Yamaha's first for 12 years - with victory at the penultimate Grand Prix in Phillip Island. A final win at the Valencia Grand Prix also ensured that the Yamaha Factory Team won the team title. In 2005 he is joined in the Gauloises Yamaha Team by his former Suzuka Eight-Hour team-mate, Colin Edwards. The son of former racer Graziano Rossi, Valentino contested his first bike race at the age of 12 when he switched from Karts to Minimotos. He quickly progressed through the Italian domestic scene, collecting a 125cc Italian Sports Production title along the way, before being crowned 125cc Italian Champion in 1995 and taking third in the 125cc European Championship in the same year. His World Championship debut came at the Malaysian Grand Prix in 1996 and he finished his first international season in ninth place with one race win. The following year he became the youngest ever rider to win the 125cc World Championship, winning eleven races along the way with Aprilia. The pattern continued when he moved into the 250cc class, taking second place in his first year before becoming World Champion in 1999, once again with Aprilia. In 2000 he entered a new phase of his career when he joined forces with Honda in the 500cc class. He proved his worth once again by finishing second, before becoming the last ever 500cc World Champion in 2001. 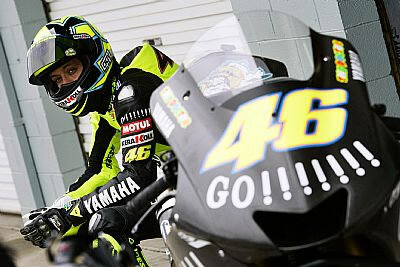 Rossi has held onto his crown ever since, taking the MotoGP World title in 2002 and 2003, before making his sensational switch to Yamaha for his victorious 2004 season. He turns 26 in February and remains the youngest rider to have won World Championships in all three classes. He continues to have the support of his long-standing Crew Chief, Jeremy Burgess, who moved from Honda to work with him in the Yamaha Factory Team. One of the most popular members of the paddock, 'The Doctor' has a wide fan base all over the world. A keen football fan and a promising rally driver (F1? ), He is now based in London between races.